Assignments, Tests and Surveys (AT&S) offers instructors the ability to download onto their desktops all student submissions (inline and / or attachments) for essay or task questions included in their assignments or exams. The functionality to batch download all submissions for a question to review offline is available in AT&S under “Grade Questions”. While in AT&S, click on Grading, click on the title of the assessment, and then click on Grade Questions, as in the below screen shot. A list of the questions (one or more) for the assessment will be listed. To the right of each question, you will see a zip file with all the submissions. A zip file is automatically created by the system once student submissions have been turned in. A link to the zip file is available to the right of the question (under “Grade Questions”) for instructors to download. The zip file includes the title of the site to differentiate it from other zip files on one’s desktop. *The original name of student uploaded files is preserved. Submissions are sorted alphabetically by last name. Submissions from students who have the same last and first name can easily be identifiable by the userid that is included in parentheses. 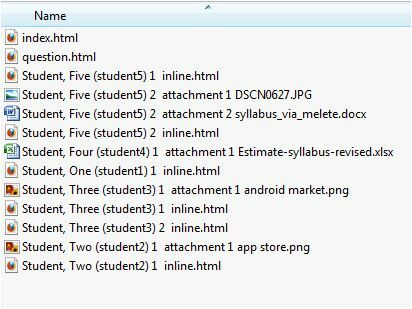 All assessment submissions by the same student (inline and / or attachments) are grouped together. The latter is important if instructors require that students submit multiple attachments as part of the question. 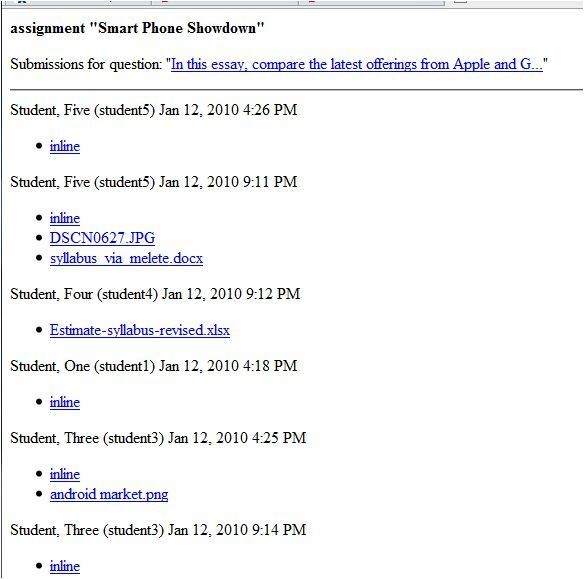 The “question.html” file includes the text of the question, so that instructors can refresh their memory as to what they are grading if they don’t get to the downloaded submissions right away. The “index.html” file lists the question and all the student submissions in a user-friendly web page, allowing the instructor to view and open each submission, grouped by student. The date of the student’s assessment submission is also included. At the top of the index.html page, a link to the question is provided for easy review of the assignment or essay text. Here is an example of an index.html page, designed to ‘look up’ the contents of the folder. If a student submits more than once (i.e. was allowed to resubmit), all of their submissions will be listed. You can recognize which submission is first, second, etc. by the date stamp.